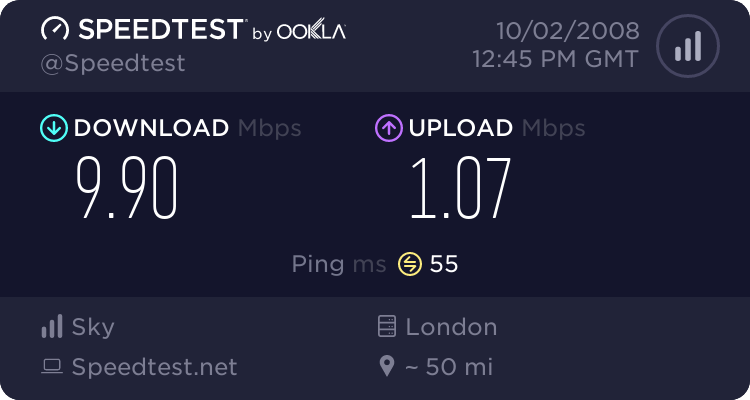 Finally I have a fast and stable broadband connection thanks to NTL. It was installed last Friday and since then I have not had one disconnect. Contrast with Freedom2Surf’s LLU service which was flaky and prone to disconnects. I also seemed to suffer some accusations of lag while gaming online although I was never entirely convinced it was me. Saying that, there has been no lag at all since NTL was installed. Secondly the speed is impressive – most impressive. About 30 minutes after the line was installed I took an ADSLGuide speedtest which you can see here. Almost a full fat 10Meg connection. 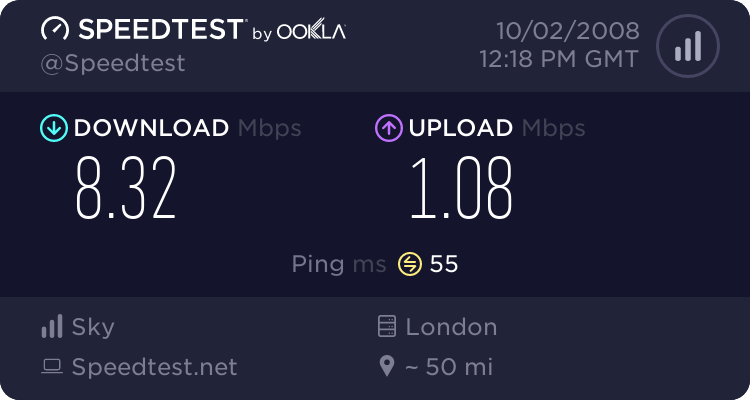 Real world speeds i.e. downloading, streaming and general web surfing have also been very impressive. Web pages were a lot snappier than previous suggesting that NTL’s DNS servers are working really well compared to my last two providers. 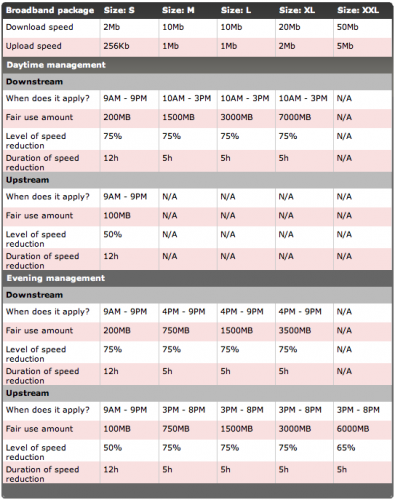 Contention however can definitely be seen with NTL but not to the same extent as the ADSL network in my area. Yes I’m in a Glasgow on a big exchange (western) but to slow down at night to less than 50k/sec is pretty unacceptable. I should have been seeing 6Meg. I find NTL is dropping to 4-6Meg in the evening but at other times maintains the 9-10Meg speeds. SO after one week I can only recommend NTL’s cable service. I’ll update later in the year once I’ve had more experience of their long term performance. Finally – Freedom2Surf have lost the plot. I cancelled with them last week but they had the cheek to phone this week and offer 2 free months connection and a promise to fix all my issues. I wasn’t impressed with this at all – why not fix the problem while I’m a paying customer and not when I leave. Sounded like they have had quite a few users leave recently. They also admitted today that they have been traffic shaping over the last weeks. I wish they had been up front so that people knew this was happening – it would have saved a lot of wasted time and money in contacting their support desks. Their reputed honesty and good support seems to have gone out of the window. In case you haven’t figured it out I didn’t take them up on their free months offer. Good riddance.